FMIN Partner Daniel and his son Lionel Kizhakkevila recently visited four small villages in India and wrote to share the experience with us. Daniel says "I see every village in India is ripe for harvest. Native missionaries, unknown by any one work hard in these villages." Daniel's ministry, Mercy Home has adopted twelve pastors to support. Each pastor works in more than three villages and have fellowships of 40 to 60 people. They are doing the unseen work of God while barely eating one meal a day. Daniel says "God is doing some awesome works in India. I am glad we can be a part of it." 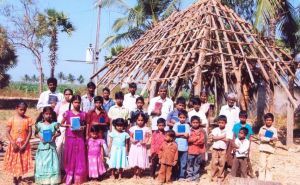 The photo shows a village church believing for a roof.